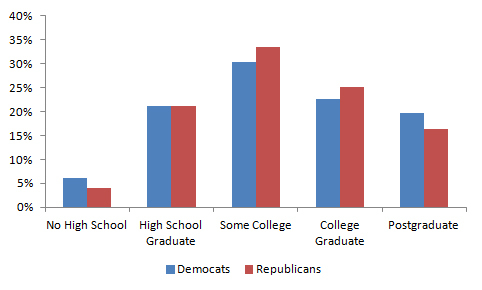 Four years ago, I analyzed the education levels of those who voted for the Democratic candidate for President and the Republican candidate for President for a total of six Presidential and Midterm elections. In that analysis, I had concluded that people at both the high and low ends of the educational spectrum had tended to favor Democratic candidates. Below, I’ve updated the original article to include new data and insights from the 2016 Presidential elections. A frequent meme oft repeated on the web is that conservatives are inherently less intelligent than liberals. Admittedly, some prominent conservatives make statements that go against the mainstream scientific consensus on topics such as global warming and Darwin’s theory of evolution. That said, these examples do not mean that being a conservative automatically implies a lower IQ or education level than being a liberal does. Back in 2013, I ran the numbers to test the assertion that liberals are more educated than conservatives, and it turned out to be inaccurate consistently from 2000 to 2012. Instead, a pattern emerged that showed that the least educated and most educated voters tended to favor Democratic candidates. 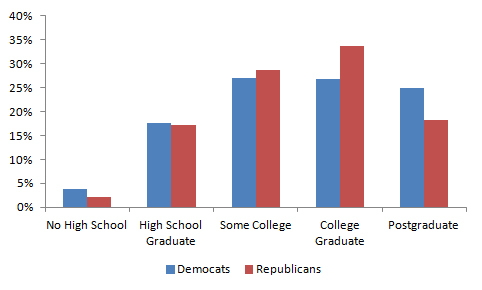 While, voters with high school, some college, and college graduates without postgraduate degrees tended to favor the more conservative candidate. In my opinion, certain liberal policies appear to have an underlying paternalistic tone. They hold that the poor and uneducated need the help of wiser government bureaucrats to protect them from themselves. Many liberals believe it is unfair for society to hold people accountable for their own condition. Therefore, the ignorant and benighted conservative voter should just fall in line and let the ivory tower intelligentsia dictate how society ought to run people’s lives. The intellectual is, after all, so much smarter than the average working stiff. Of course, average working stiffs and/or business owners who have some college or are college graduates have made their own way in the world, have taken risk, and have a strong desire to control their own fates. They resent fiats from a central authority led by a group of over-educated individuals with little or no prior business experience. To implement this idealistic worldview, mainstream liberalism needs muscle, and that muscle comes from the undereducated masses who stand to benefit from a dogma seeking to redistribute the income earned by others directly to them. 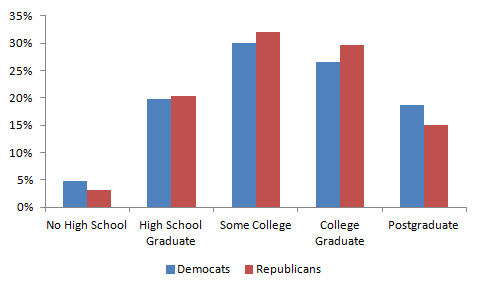 As such, the distribution of liberal and conservative education levels should differ sharply. Liberal education levels should have fatter tails at the low and high ends of the educational spectrum, while conservative education levels should be more concentrated in the middle. To test my theory, I looked at education levels by voter in the 2000, 2004, 2008, and 2012 presidential elections, as well as the 2006 and 2010 midterm elections. 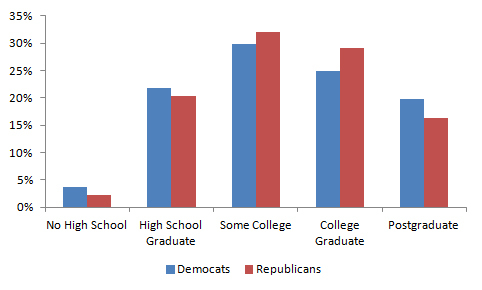 In every case, the share of people with no high school education was higher among people voting for Democratic candidates than it was among people voting for Republican candidates. On the opposite end of the spectrum, in every case, the share of people with a postgraduate education was higher among people voting for Democratic candidates than it was among people voting for Republican candidates. Unfortunately, the data for 2016 is inconclusive, and it is inconclusive for the reason that most conservatives don’t trust the mainstream media: framing. In 2016, CNN combined the No High School and High School Graduate categories into one super category called High School or Less. Because of this change, deliberate or not, CNN made it impossible to segment the least educated voters with this data set, and therefore very difficult to determine if the least educated voters continued to support the Democratic candidate in 2016. Based on the above data, from 2000 to 2012 it’s clear that people at both the high and low ends of the educational spectrum tended to favor Democratic candidates. However, while that conclusion still held at the high end of the educational spectrum, CNN’s elimination of the category at the lowest end of the educational spectrum makes it impossible to conclude whether that group still favored the Democratic candidate in 2016. What one can say is that voters with a high school education or less voted reliably for the Democratic candidate from 2000 to 2012, but then shifted their vote to the Republican candidate in 2016. 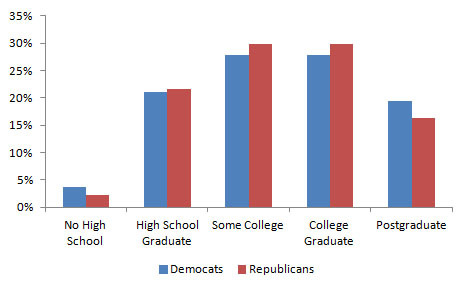 However, based on this data set, it is impossible to conclude that this shift was due to either an increased proportion of voters with no high school education, an increased proportion of voters with a high school education, or an increase in both groups voting for the Republican candidate. This entry was posted in Business, Education, Policy, Politics and tagged Decision 2012, decision 2016, Democrats, Donald Trump, Elections, Hillary Clinton, Intelligence, IQ, obama, Republicans, Romney. Bookmark the permalink. You really struck a nerve with this post. Comments still go on and this thread may never die. Your observations about how the middle classes resent the paternalism of the intellectuals was spot on. I wish you continued success with your SiFi writing career. There was a change for 2016 — the college graduates voted for more for the Democratic candidate for the first time. They and the ones with post-graduate degrees disliked Trump, it appears. Yup. The data certainly supports that view for sure.